Possibly the biggest factor effecting your electric bill is the weather. It not only directly influences how much you use to heat or cool your home but also affects the demand, supply, and ultimately the price of energy on the wholesale markets. In our What’s the Weather? series, we’ll track weather forecasts and events to see how they impact your energy bills and how that information can help you save. As the nation leaps into action helping the victims of Hurricane Harvey, it’s important to remember that this year’s hurricane season is just beginning to reach its peak. Current conditions in the Atlantic and Caribbean basins are practically ideal for storm formation and there’s a good probability that more storm systems may yet threaten the U.S. Within the next week, forecasters are watching two systems. The first is Hurricane Irma which is expected to reach Category 3 (major hurricane) when the reaches the mouth of the Caribbean at the Lesser Antilles. Beyond that, it could go anywhere. It could swing north along the U.S. east coast or head northwest into the Caribbean. Neither possibility is good news. The other system being watched is a low pressure front that’s developing in the western Gulf and slowly heading north. The current forecast favors slow development, bringing more rain for Texas and Louisiana. But because of the very warm SSTs in the Gulf and little wind shear, it’s not certain what may happen. Beyond the next five days, there’s still lots of chances for even more storms to come. 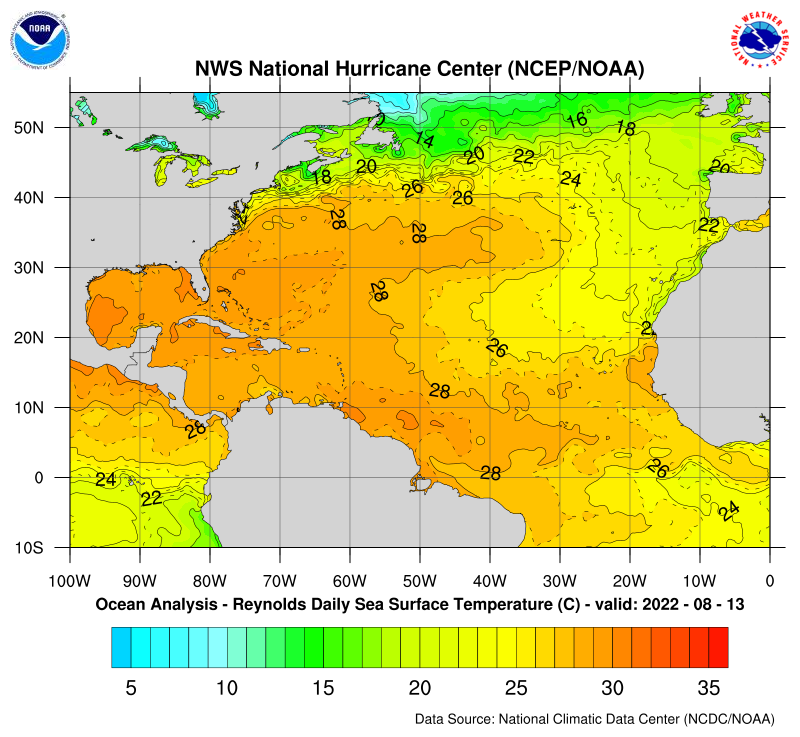 As of August 30, most sea surface temperatures (SSTs) in the main development region are 84.2°F (29°C ) with temperatures in the Gulf of Mexico at 86°F (30°C). Hurricanes form over water that’s 82°F (28°C) or above. Along the U.S. east coast, this kind of warm water off shore reaches as far north as the Delmarva Peninsula. In fact, on August 31, at 1 PM, Wrightsville Beach, NC reported water temperature at 82°F. Even though SSTs dip into the 70s all the way up to Maine, there’s enough warm water off shore to sustain a major hurricane along the entire length of the east coast. Currently, the El Niño Southern Oscillation (ENSO) has basically flat-lined its temperatures to neutral. With no cooling (La Niña) or warming (El Niño) to the equatorial Pacific, there’s no change in the way Earth’s atmosphere circulates (called the Walker Circulation). In El Niño years and some El Niño-leaning neutral years, there’s wind shear over the Gulf of Mexico and into the equatorial Atlantic. Wind shear occurs when air moves vertically. When a storm system encounters strong wind shearing, the storm’s structure becomes distorted so that it can’t maintain the flow of heat and moisture. Wind shear can snuff out a hurricane or prevent one from ever developing. Unfortunately, current ENSO Neutral conditions are not producing much wind shear. In fact, the current ENSO Neutral conditions are expected to continue through February, 2018. With all these looming yet uncertain possibilities, it’s important to be alert and prepared for tropical storms during hurricane season. As strange as it sounds, hurricane storm systems have hit every state in the Union with damaging winds and flooding from rain. No matter where you live, make sure you and your family are prepared and have a plan for severe weather. You can also follow Direct Energy on Twitter for up-to-date information on emergencies in your area to help you weather any storm.